The Hitachi DS 18DSDL Cordless Drill Driver kit brings everything you need to go to work now and in the distant future. When my trusty cordless drill driver finally dropped dead after a dozen years or so of service I knew that I needed to replace it with another tough model that could stand up to my frequent use. I am not a fan of frills and whistles but rather a tool with usable features that make a difference in my shop. Most of all I wanted dependability. I had heard of the new Hitachi DS 18DSDL Cordless Drill Driver so got one for my shop and this review. Once again Hitachi would not disappoint. 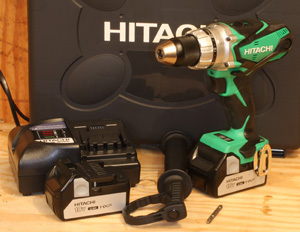 The Hitachi DS 18DSDL Cordless Drill Driver kit featured in this review comes with the drill driver itself plus 2 Lithium Ion 3.0Ah slide type battery packs, a Rapid Lithium Ion Slide Battery Charger, a double-ended Phillips driver bit, removable side handle and a custom carry case that keeps everything protected and organized. The Hitachi DS 18DSDL Cordless Drill Driver is a full-sized unit that features a ½” (metal) keyless chuck controlled by a 22-position clutch that lets you apply the amount of slip you need for the fastener being worked with. That turns out to be important because the industrial-style 2-piece motor develops up to 814 in-lbs of torque. The clutch also lets you lock the clutch for drilling operations. The keyless chuck and clutch (left) are simple to operate, predictable and tough. The motor (right) is exceptionally powerful and even has externally accessible brushes! To maintain durability in the face of all that power the Hitachi DS 18DSDL Cordless Drill Driver features an aluminum gear case. They even added externally accessible carbon brushes for uber-users. Despite the substantial list of features and construction the Hitachi DS 18DSDL Cordless Drill Driver weighs in at a trim 4.6-lbs. The Hitachi DS 18DSDL Cordless Drill Driver features a true variable speed trigger switch that makes controlling it for driving fasteners easy. And slider button above the trigger controls forward and reverse modes plus locks the trigger in the off position when left in the center detent. The Hitachi DS 18DSDL Cordless Drill Driver has two speed ranges, selected through a slider switch atop the motor housing. In low range the trigger varies the speed between 0 and 350 rpm and in high range between 0 and 1600 rpm. The handle area is ergonomically designed and equipped with a rubber overmold that both absorbs vibrations (what little there is) and gives the hand a non-slip grip. 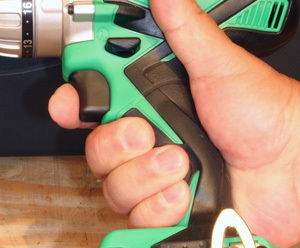 Even when using the Hitachi DS 18DSDL Cordless Drill Driver for long periods the grip remains comfortable to the hand. They also include a removable side handle most commonly used for heavy drilling operations where additional pressure is needed. For added versatility the Hitachi DS 18DSDL Cordless Drill Driver comes with a bright LED light that shines forward. It is hard to describe how handy this is when the light gets low or the eyes get old. Finding the fastener is way easier for just about everyone when the area is well lit. A simple button on the base of the tool turns the LED light on and off so you can use it only when needed. The batteries have a slider connector (left) that makes installing them quick and safe. The included charger (right) does everything for you except plugging it in and putting the battery on it! 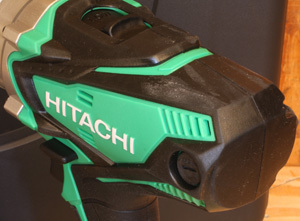 The Hitachi DS 18DSDL Cordless Drill Driver also sports a metal belt clip. The clip can be moved to either side of the tool with one screw. A drill driver is useful in many places and being able to hang it on your belt makes it easier to move the Hitachi DS 18DSDL Cordless Drill Driver and everything else you need to the next work position. The Hitachi DS 18DSDL Cordless Drill Driver is powered by an 18V Lithium Ion slide-type battery, a technology known for fade free power, lighter weight than comparable capacities in other battery chemistries along with up to three times the life of traditional batteries. All of those traits are welcomed in a cordless tool meant for the shop or work site. 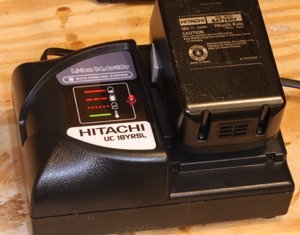 A side benefit of these battery packs is that they are compatible with all other Hitachi slide type 18V battery systems. 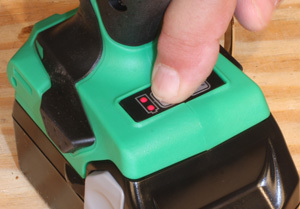 A button on the base of the Hitachi DS 18DSDL Cordless Drill Driver displays the general condition of the battery with two LEDs. This is a quick check of the remaining charge so you can replace a discharged pack before going to the job. A button on the base (left) shows you the battery condition. the grip (right) is nicely shaped, comfortable and gives you a good sense of grip and control. 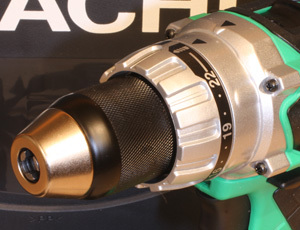 The Hitachi DS 18DSDL Cordless Drill Driver is a sizeable tool but feels much smaller in the hand. The design of the handgrip along with the balance of the tool reduces the strain of using it especially over long periods. The controls are logically placed and easy to use. I like the full-throw trigger that makes accurate controlling of the rpm easy. The keyless chuck works easily and grips bits tightly. Spinning it from one size to another is quick and simple. Turn it down to the size of the bit, give it a twist and it locks in place. Breaking the chuck loose for a bit change is just as easy. Turn the clutch to the “drill” graphic and the Hitachi DS 18DSDL Cordless Drill Driver is ready for drilling in virtually any material. I like tools that are not straining to accomplish everyday tasks and the Hitachi DS 18DSDL Cordless Drill Driver fits that criteria and more. Even when drilling metal the Hitachi DS 18DSDL Cordless Drill Driver seems to cruise through the job which promises a very long life in the environment of the home workshop. The batteries last long enough that I have been forgetting when I charged them last. 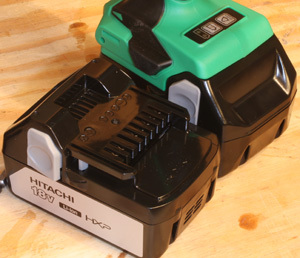 I tend to use my cordless drill frequently but the Hitachi DS 18DSDL Cordless Drill Driver battery has taken much longer to wind down than expected. The included charger is very easy to use and keeps the included spare battery pack in top condition. The Hitachi DS 18DSDL Cordless Drill Driver is a nicely designed cordless drill driver that has the features we need and makes them all easy to use. Everything works as expected so there is no learning curve to use this tool. I have owned other similar tools that came with useless eye-catching features that just got in the way of the normal tasks. The Hitachi DS 18DSDL Cordless Drill Driver does not suffer such over engineering. What it does bring is a solid design that has been well built to insure a long life span in your shop. With a street price of just $363.00 (9-10-2013) for the kit shown here is not for those who buy for low price only. The Hitachi DS 18DSDL Cordless Drill Driver is not cheap but over the long expected life of this tool the cost of owning it becomes a major bargain. Have a comment on this review? - Email Me! All NewWoodworker.com Custom Plan Sets, written, photographic and drawn materials are property of and copyright by NewWoodworker.com LLC 2000-2016. Materials may not be used in any way without the written permission of the owners.